We intend to drop silica gel when our current supply runs out, probably in 2019. Silica gel can be used to dry seeds for long-term storage or to dry flowers. In most climates, seeds can be air-dried in a covered, well-ventilated space; however, in moist climates, it may be necessary to use additional drying methods such as curing seeds in a dehumidified space or drying seeds with silica gel. When used as directed, silica gel dries seed from typical 12% moisture content to a desired 3-5% moisture content. Note: Legumes should not be dried below a 6% moisture content. To dry seed, place equal weights seed and silica gel together in an airtight jar for seven days. A muslin bag or other cloth can be used to keep seed and gel separate. Silica gel can be used many times and re-dried in the oven. 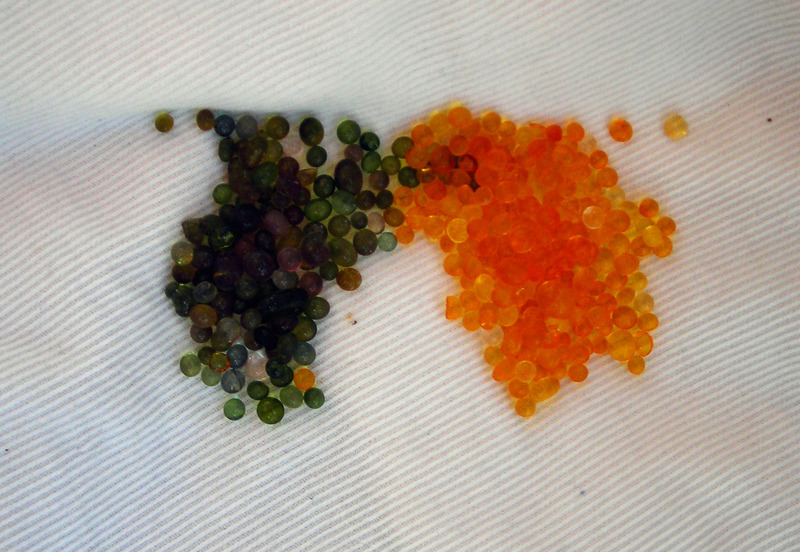 We carry 2-5mm color-indicating silica gel beads that contain phenolphthalein as a moisture indicator at 100 ppm. The gel is orange when completely dry and changes to dark green as it absorbs moisture. We have been alerted that most blue-to-pink indicating silica gels contain cobalt chloride, which might pose a risk of cancer; the primary concern is with dust inhalation. Silica gel can have a drying effect on skin, eyes, and mucous membranes, so caution is recommended.